Glutathione // Acetylcysteine - The new old SuperDrug !?! 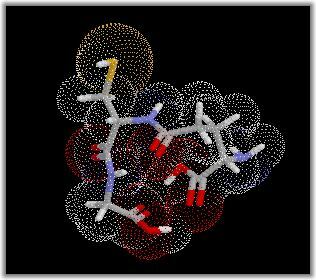 Where is the link between N-Acetylcysteine and Glutathione ? In short words: N-acetylcysteine (NAC) is precursor of glutathione (GSH). The acetyl rest is tributed to a tissue friendly behaviour. Also solubility problems play a role. In the next complex steps NAC is transformed via L-cysteine into GSH. Glutathione is a natural occuring peptide (Hopkins 1921) - a sequence of amino acids (glutamine, cysteine, glycine). Glutathione is found in blood and most cells of the body in (high) concentrations (millimolar range). GSH is a powerfull antioxidant. Glutathione exists in the reduced form (GSH), and is in a equilibrium with its oxidized form (GSSG) - a disulfide. The principle of action as an antioxidant is based on the fact, that it reduces other toxic substances before they can demage other molecules or important parts of the cell. In this case GSH is oxidized to GSSG. The ratio of GSSG/GSH is an important marker of oxidative stress. The biochemical conversion from L-cysteine into glutathione is shown here. And the following metabolism of glutathione is shown here. There exist thousands of articles about GSH, please go to the NAC-Literature section to find more. If you want to read more online about GSH please read this review (by Ben M Lomaestro and Margaret Malone).